TheBMW R nineT"90 years of BMW Motorrad" was one of the most interesting motorcycles that was seen during the EICMA show last November. With its 1,170 cc air/oil-cooled boxer engine, cutting-edge technology and a modular concept, the nineT was also conceived to offer the maximum scope of personalization thanks to its special frame concept. The tubular steel space frame that was specially developed for the nineT incorporates the boxer engine as a load-bearing element. The frame's basic construction consists of a front frame section with integral steering head and a rear section with swingarm mounting. Personalization is what renowned French designer Nicolas Petit has done to the BMW R nineT, with two interesting and very alluring concepts. Petit has created some very striking motorcycle concepts in the past and many of them of them are coming to life thanks to BMW accessories provider Wunderlich (wonderful in German). Petit has already offered us the super aggressive, jaw dropping off-roader, BMW S1000 RR “Mad Max”, and the captivating and retro looking BMW R1200R Mystic Concept roadster. The brilliant and imaginative Petit proposes two types of interesting concepts for the R nineT that are clearly inspired by the long and glorious history of BMW motorbikes. 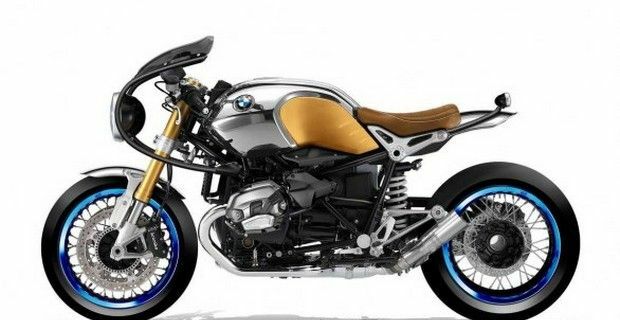 The first concept rendering (pictured) features a naked design of the nineT that somehow evokes both the retro cafe racer style mixed in with a touch of modern street bikes with its single seat, shiny chrome accent on the gas tank, and low and short exhaust system, and above all an extremely minimal and unique looking arched front cowl design that holds a classic, round headlight. The second concept shows off a half fairing with rounder lines, but it has a sportier and more flowing design with scrambler side plates, a solo seat and a flared Akrapovic unit that radically alters the appearance and character of the nineT.